Asparagus is a fairly new addition to my kitchen, about four years I would say. Usually I just roast the asparagus in a griddle pan or under the grill with some olive oil and then sprinkle some salt and drizzle either lemon, vinegar or balsamic vinegar. This simple vegetable tastes just great as it has a very distinct flavour. I remember making mashed asparagus for my son when he was a baby and my mother saying will he like that? As she had never tried it before, I asked her to try it and she thought it was an ok taste. I am glad that I have introduced such great flavours to my son from an early age, as it has introduced him to a great range of flavours, textures and tastes. Recently, when I saw a recipe on one of the blogs I regularly visit, I thought I have to try it because the British asparagus season does not last very long. It is said that Asparagus is high in potassium, folic acid and low in sodium and calories, and is good for us as it does not contain any fat or cholesterol. I am a great believer in eating the right foods to help us maintain a healthy lifestyle and if the food that I eat contains things I know that are good for our health/well-being then we should eat more of them. As a result I was glad that I tried this recipe. It was a great hit with the family and a recipe which I will make again with a few changes next time. 1) In some salted boiling water blanch the asparagus for about 4 to 5 minutes. In the mean time prepare all the other ingredients for the pesto and place in the blender. 2) Once the asparagus are a bright green colour and still slightly firm when pressed remove from the boiling water and run under the cold water tap to stop the cooking process. I used a fork to remove from the water to place in a strainer. Keep aside. 3) In the same water place the spaghetti ensuring the vessel is large enough for the spaghetti to be cooked. This added more flavour to the pasta and did not waste the water. Cook for 10 mins or as per the cooking ingredients to the pasta being used. 4) Trim the tips of the asparagus and keep aside to toss into the spaghetti later. Roughly chop the ends and add to the remaining ingredients in the blender. Process to a paste or the required consistency. 5) Once the spaghetti is cooked, drain and run under some cold water to remove the starch and stop from cooking further. Mix with the prepared pesto and the chopped spears of the asparagus. Drizzle with some extra virgin oilve oil and you are ready to serve. Bon Appetite ! Kiran ~ Asparagus is a great vegetable, give it a go I am sure you will like the taste of it, especially when griddled with some salt & vinegar as I mentioned. Thanks for the comment. 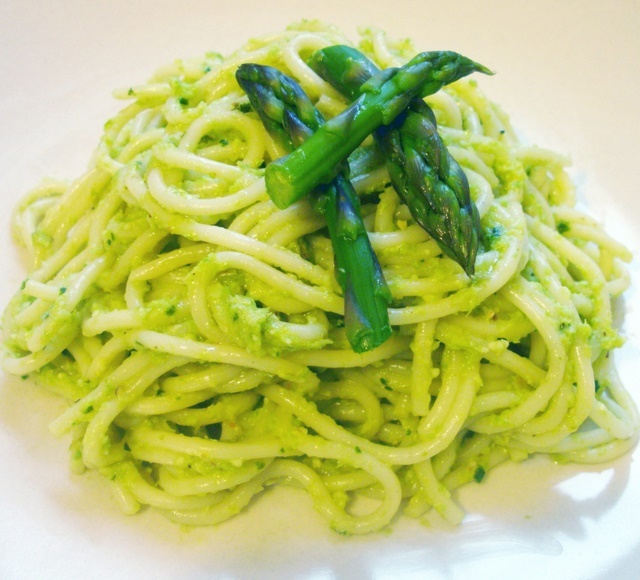 Once an Italian chef cooked some pasta with an asparagus sauce and it was simply unbelievable! This looks very yummy! Kiran ~ Until I tried this recipe I had never seen asparagus used in a sauce before, but the taste was great. You can always try adding roasted asparagus to this dish.